Liberal head coach Carter Kruger says this kind of game will help his Liberal Lady Redskins down the road. 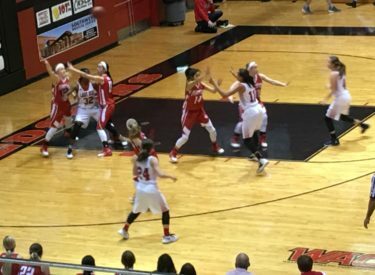 Liberal won a physical 52-28 decision over the Perryton Rangerettes Friday night in the Big House. The Lady Skins led 10-3 after one quarter and 30-13 at the half. LHS was 5-10 from three point range and 14-20 at the foul line while Perryton was 5-21 from three point range and 1-4 from the foul line. Ali Lucero led LHS with 15 and Machia Mullens dropped in 14. Jada Mickens added nine. Perryton’s Addyson Moseley scored 10 in the loss. LHS is 5-0 at Christmas break and for the first time since the 2008-09 season. Perryton drops their third straight and is 8-5. Perryton plays at River Road Tuesday. LHS plays January 3 at Northwest Classen.